Melt butter and add brown sugar to form a creamy paste. Let this mixture caramelize over medium heat for approzimately 5 minutes. Stir in the banana liqueur, bananas, and rum. Heat and ignite. Agitate to keep flame burning, and add a few pinches of voodoo magid (cinnamon) to the flame. Let flame go out, and serve over ice cream. Preheat oven to 350 degrees F. Grease an 11 x 7-inch square baking pan with oil. In a medium bowl, stir together 2 1/2 cups of the pastry flour, sugar, baking powder, baking soda and salt. In a large bowl, whisk together the egg, buttermilk, 2 tablespoons melted butter and vanilla until smooth. Stir in the mashed bananas. Gradually add in the dry ingredients until just combined. Stir in the blueberries. In a small bowl, combine the remaining 1/4 cup flour and the brown sugar. Cut 4 tablespoons of butter into the mixture. Scoop the batter into the baking pan and top with the brown sugar mixture. Bake until golden and a skewer inserted into the middle comes out clean, about 45 to 50 minutes. Let cool for 15 minutes before serving. Recipe reprinted by permission of Cooking.com. Preheat the oven to 350 degrees F. Butter and lightly flour a 2-quart ramekin or souffle dish and tap out the excess flour. Put the ramekin on a baking sheet. Combine the flour, baking powder, baking soda, salt, cinnamon, allspice and ginger in a large bowl. Whisk the butter, granulated sugar, brown sugar, banana, sour cream, eggs and vanilla in a separate large bowl until smooth. Whisk the flour mixture into the banana mixture until just combined. Pour 2 1/2 cups of the batter into the ramekin and stack the ice cream bars on top of each other in the middle. Pour the remaining batter around the sides and over the top of the ice cream bars. Preheat oven to 350°F. Grease and flour 10-inch Bundt® pan or tube pan. Combine cake mix, eggs, banana, oil, sugar, milk and vanilla in large bowl. Beat with an electric mixer at medium speed for 2 minutes. Stir in 1 cup pecans by hand. Bake 45 to 50 minutes or until toothpick inserted in center comes out clean. Cool cake on wire rack 25 minutes. Remove cake from pan and cool completely. Spread frosting on cake and top with remaining pecans. Preheat the oven to 350°F. Grease a 9-inch springform or round cake pan with butter. Line the bottom of the pan with parchment paper. In a small, heavy-bottomed pan over medium heat, melt 4 tablespoons butter. Add the brown sugar and stir with a heatproof spatula or spoon to break up the sugar. When the mixture begins to bubble, remove from heat, and pour the mixture into the bottom of the pan. 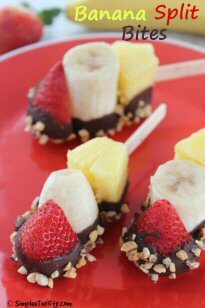 Arrange a single layer of banana slices on top of the mixture; set aside. In a large bowl, cream the butter and sugar till light and fluffy. Add the eggs one at a time, mixing after each addition, then mix in the vanilla. In a medium bowl, whisk together the flour, baking powder and salt. Mix half of the flour mixture into the wet mixture. When the flour is well incorporated, mix in half of the milk. Repeat again, alternating with the remaining flour mixture and milk. Stir till well combined, but do not overmix. Remove 1 cup of the batter and place in a small bowl. Stir in the cinnamon, and set aside. Spoon half the batter from the medium bowl into the prepared pan. Spread with a spatula to ensure an even layer. Next, spread the cinnamon-infused batter to create a middle layer. Then finally, spread the remaining vanilla batter on top. Tap the pan a several times on the counter to remove air bubbles and pockets. If using a springform pan, wrap foil around the bottom of the pan. Bake in the oven till golden brown and when a tester comes out clean, 40 to 50 minutes. Tip: Using bananas that are still firm will ensure that they keep their shape during and after baking. Bake the bread: Place a rack in the center of your oven and preheat the oven to 350°F. Lightly grease an 8×4-inch loaf pan with nonstick spray and set aside. Mash the bananas in the bottom of a large bowl until mostly smooth. Whisk in the egg, then the yogurt and oil. If you’re using coconut oil and it resolidifies, microwave the bowl for a few seconds to melt it. Whisk in the maple syrup, brown sugar, and vanilla. Sprinkle the baking soda, ginger, and salt over the top, then stir until combined. Gently stir in the flour until barely combined, then fold in 1/2 cup of the cranberries. Scrape the mixture into the prepared pan. Bake for 50 to 60 minutes, until a toothpick inserted in the center comes out clean. Check at the 35-minute mark and tent with foil if the bread is browning too quickly at the corners. Place the pan on a wire rack and let cool for 15 minutes. Remove from the pan and place on the wire rack to finish cooling completely. While the bread cools, prepare the cream cheese white chocolate topping: In a mixing bowl, beat together the cream cheese, Greek yogurt, and vanilla extract on medium speed until smooth. Reduce mixer speed to low, then slowly add the powdered sugar until combined. In a microwave-safe bowl, combine the white chocolate and coconut oil. Microwave, uncovered, at 70% power for 20 seconds, then stir. Continue microwaving at 70% in 20-second bursts, stopping to stir between each. When the white chocolate is almost but not completely melted, remove from the microwave and stir until completely smooth, letting the residual heat melt the white chocolate the rest of the way. To bake this recipe as 12 muffins instead of in a loaf pan, lightly grease a standard muffin tin, then divide the batter evenly among the cups. Bake at 350°F for 20 to 22 minutes, until a toothpick inserted in the center comes out clean and the muffins spring back lightly when touched. a medium bowl, combine flour, baking soda and salt with a wire whisk. Set aside. Preheat oven to 350°F. Grease an 8 x 8-inch baking dish and set aside. In a medium bowl, using an electric mixer, cream together butter and sugar until light and fluffy, about 1 to 2 minutes. Add egg and mix well to incorporate. Add sour cream and vanilla and continue mixing until well blended. Add dry ingredients, about 1/3 at a time, beating at lowest speed briefly with each addition until dry ingredients are just barely incorporated. Fold in mashed banana by hand and stir until blended. Pour into greased baking dish and bake for 30 to 35 minutes or until toothpick inserted in center comes out clean and center springs back to touch. Set aside to cool. Beat butter and cream cheese until creamy. Gradually add sugar, beating until light and fluffy. Add eggs, one at a time. Combine flour and next three ingredients. Gradually add to butter mixture; beating on low just until blended. Stir in bananas, nuts and vanilla. Spoon batter into 2 greased loaf pans. Bake at 350°F for about 1 hour or until a wooden pick inserted in center comes out clean. Cool before slicing, if possible! Enjoy! In a mixer bowl, pour sugar and softened butter, beat until well blended. Add 1 egg at a time to mixer bowl and beat until well blended. Then add mashed banana, yogurt, vanilla and rum to mixer and beat till smooth. Add flour mixture to mixer bowl and blend until completely moist and no lumps. Fold in sweetened coconut and combine. Pour batter into 9 X 5 inch greased loaf pan. Bake at 350°F for 50-60 min. Check at 50 minutes. You want a toothpick at highest peak to come out clean. Cool on wire rack in pan 10 minutes. Combine glaze in small bowl till smooth. Drizzle glaze over warm bread after removing from pan. 1/2 cup ﬂaked sweetened coconut +1 tbls. Combine ﬂour, baking soda, and salt, stirring with a whisk. Then add ﬂour mixture; beat at low speed just until moist. Stir in 1/2 cup coconut. Bake at 350°F for 1 hour or until a wooden pick inserted in center comes out clean. Cool in pan 10 minutes on a wire rack; remove from pan. Preheat oven to 400°F.Coat 12 muffin cups with cooking spray. Whisk whole-wheat flour, all-purpose flour, baking powder, baking soda, cinnamon and salt in a large bowl. Make a well in the dry ingredients; add the wet ingredients and stir with a rubber spatula until just combined. Stir in chocolate chips, if using. Scoop the batter into the prepared muffin cups (they'll be quite full). Sprinkle with walnuts, if using. Bake the muffins until the tops are golden brown and spring back when touched lightly, 15 to 25 minutes. Let cool in the pan for 5 minutes. Loosen edges and turn muffins out onto a wire rack to cool slightly before serving.Source: EatingWell Magazine. *Ingredient Notes: You can use buttermilk powder in place of fresh buttermilk. Or make "sour milk": mix 1 tablespoon lemon juice or vinegar to 1 cup milk. **Unprocessed wheat bran is the outer layer of the wheat kernel, removed during milling. Also known as miller's bran, it can be found in the baking section. Do not substitute bran cereal in this recipe. Preheat oven to 350°F. Lightly butter and flour 9-inch square pan (see Note). In large bowl, beat together butter and sugar with electric mixer until creamy. Add egg and rum. Mix to combine. In small bowl, whisk together flour, baking soda, baking powder, cinnamon, and salt. Gradually add to butter mixture. Mix in bananas and pecans, then stir to incorporate. Pour batter into prepared pan and spread evenly. Bake for 20 to 25 minutes or until toothpick inserted in the center comes out clean. Remove pan to a wire rack to cool completely. In large bowl, combine butter, cream cheese, sugar, and extract with an electric mixer. Beat until light and fluffy. Add cinnamon and 1 cup confectioners’ sugar; blend until smooth (careful; over mixing will cause separation). Add additional confectioners’ sugar to create desired consistency. Note: For a thicker bar, use an 8-inch square pan. Mix ingredients and pour into coated pan. Bake at 350°F. Bake for 1 hour. Set oven at 350°F. spray 8 1/2x4 1/2" loaf pan with Pam. Whisk flour, baking soda, and salt together in large bowl. Place 5 bananas in microwave safe bowl; cover with plastic and cut several steam vents. Micro on high until bananas are soft and have released liquid, about 5 min. Transfer bananas to fine mesh strainer placed over bowl and allow to drain. About 15 min. Transfer liquid to med. saucepan and cook over med. heat until reduced to 1/2 cup, about 5 minutes. Remove pan from heat, stir reduced liquid into bananas, and mash with potato masher until fairly smooth. Whisk in butter, eggs, brown sugar, and vanilla. Pour banana mixture into flour mixture and stir until just combined with some streaks of flour remaining. Gently fold in walnuts. Scrape batter into prepared pan. Slice remaining banana diagonally into 1/4" thick slices. Shingle banana slices on top of either side of loaf, leaving 1 1/2" wide space down center to ensure even rise. Sprinkle gran. sugara evenly over loaf. Preheat oven to 350° F. Generously grease a 9 x 5-inch loaf pan; set aside. In a large bowl, combine flour, sugar, brown sugar, baking powder, salt, cinnamon, bananas, milk, vinegar, vegetable oil, and egg. Beat at medium speed of electric mixer for 30 seconds or until dry ingredients are just moistened. Stir in macadamia nuts. Spoon batter into greased pan. Preheat oven to 350°F. Grease a 9- x 5- x 3-inch loaf pan or large muffin tins. In a medium bowl, whisk together flour, salt, cinnamon, and nutmeg until combined. Set aside. In a large bowl, beat eggs, sugars, vegetable oil, sour cream, and vanilla. Stir in banana. Using a wooden spoon, stir in flour mixture, mixing only until combined. (Small lumps will bake out.) Fold in zucchini and pecans. Notes: Do use self-rising flour for this recipe. All-purpose flour will make it too dense and gummy. Grease and flour two soup cans. Preheat oven to 350ºF. Cream sugar, egg and cream cheese. Add banana, biscuit mix and cinnamon. Stir in nuts. Fill prepared cans 1/2 to 3/4 full. Bake for 25 to 30 minutes. Test for doneness. Wrap in plastic gift and tie with raffia or ribbon for gift giving. Line 18 muffin cups with paper liners. Preheat the oven to 325°F. Bake at 375° for 40 min. in tube pan or 2 loaves. Preheat oven to 350°F. Butter 9x13" pan. Sift together flour, baking soda and salt. In bowl with mixer at med. speed beat butter and brown sugar until fluffy, about 2 min. Beat in eggs, one at a time, until combined. Beat in flour mixture alternately with buttermilk. Beat in bananas and 1 ½ tsp. vanilla until just combined. Pour into pan. Bake 30-35 min. Cool in pan on rack. Beat cream cheese, confect. sugar and remaining vanilla until smooth and creamy. Heat oven to 400°F. Grease bottoms only of 12 med. muffin cups. Beat egg slightly; stir in remaining ingredients just until moistened. Divide batter evenly among cups. Bake until golden brown, 15-17 min. Heat oven to 400°F. Line 12 med. muffin cups with paper baking cups or grease bottoms lightly. Combine dry ingredients. Add combined milk, banana, oil and egg; mix just until moistened. Fill muffin cups 3/4 full. Bake 20 to 22 min. Heat oven to 350°. Generously grease bottom of loaf pan. 9X5X3". Mix all ingredients in pan with fork; beat vigorously 1 min. Bake until wooden pick inserted in center comes out clean. 55 to 65 min. Cool 5 min. Run knife around sides of loaf; remove from pan. Preheat oven 325?F. Coat 9x5x2" loaf pan with veg. short. In a large bowl, and using a hand-operated beater, whip together banana, oil, eggs, concentrate, & water. Add flour, cinnamon, nutmeg, and nuts to banana mixture and mix. Stir in baking soda quickly, and then mix. Immediately pour batter into prepared loaf pan. Bake 50 min. Make a tent of aluminum foil and place it over the entire loaf pan. Bake another 7-8 min. or until a knife inserted in the center of the loaf comes out clean. Loosen bread from pan with a knife and turn loaf onto a wire rack to cool. Mash bananas to 1.5 cups. Cream sugar & butter. Beat in egg, sour cream, lemon peel and bananas. Combine dry ingredients; stir in raisins. Bake 350?F - 50-60 min. Move oven rack to low position so that tops of pans will be in center of oven. Heat oven to 350°F. Grease bottoms only of 2 loaf pans, 8 1/2 x 4 1/2 x 2 1/2", or 1 loaf pan 9 x 5 x 3" with shortening. Mix sugar and butter in a large bowl. Stir in eggs until well blended. until moistened. Stir in nuts. Pour into pans. Bake 8 - inch loaves about 1 hour, 9 - inch loaf about 1 1/4 hours, or until toothpick inserted in center comes out clean. Cool 5 minutes in pans, on wire rack. Loosen sides of loaves from pans and place top side up on wire rack.